All gold found in Iowa is believed to be glacial gold, brought down by glaciers that once covered the state. Geologist believe that these glaciers advanced and receded over the Midwest numerous times over thousands of years, each time bringing gold bearing gravels from Ontario and Manitoba, Canada. As the glaciers receded, these gravels were scattered about, leaving behind the gold that is still there today. 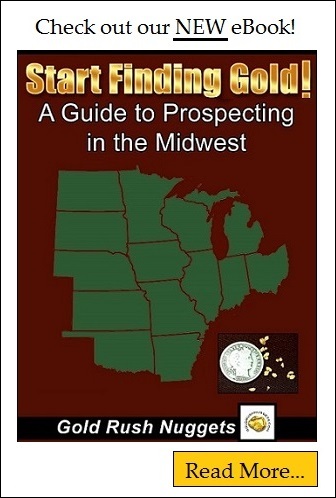 As with other glacial deposits found across the Midwest, concentrations of gold can be difficult to predict. What is easy to predict is the size of the gold. Gold found here will be extremely fine, so it is important to work carefully to retain these fine gold particles. While the gold concentrations within the state do not interest gold mining on a commercial scale, there is an active and engaged group of prospectors exploring the state in search of gold. In 1853, the first gold discovery in Iowa was along the Iowa River northwest of Marshalltown in Hardin County.. Miners descended on the area, but quickly found that the gravels didn’t pay to work, so the quickly abandoned the area. There is still plenty of gold left to be found. In Fayetteville County on Otter Creek, a geological survey in 1904 stated that a man could produce $1.00 to $1.50 worth of gold from a hard days work. If you adjust that average to today’s gold prices, it would be arguable that a miner could recover over $100 per day working these same gravels. Most believe that these reports may have been a tad optimistic, but nonetheless it does prove that there is gold to be found in the area. The Volga River and its tributaries will also produce some fine gold. In Lyon County, a small and short lived gold mine operated along the Big Sioux River. Flour gold can be found in Jasper County on the South Skunk River. Gold can be found in Turkey River, which covers several counties in northeastern Iowa. There are plenty of prospectors in Iowa that search the sandbars of the Iowa River after the river levels have dropped and successfully recover flour gold. This fine textured gold isn't always deep in the gravels; sometimes it will be found in the top inch or two of material. Check for the darker colored sands; this is where you will find the concentrations of fine gold. It is commonly said that “gold is where you find it”, and glacial gold deposits certainly go along with that thinking. Check out areas known for producing gold, but don’t be afraid to venture out and explore new areas. Work carefully to retain the fine flour gold commonly found in Iowa. Good luck!